In August 2013 Barnet Council decided to “get into bed” with Capita, when they signed the contracts, Capita Share price was 959. Back in 2010 another contractor (Connaught’s) went into liquidation. They provided the Council Housing repair service. Our members were sacked by a telephone conference call. As a result of that experience, when the Council started “courting” the private sector to run our services, Barnet UNISON warned the Council about the risk of contractor failure. The response to our feedback was, “don’t worry”, “Capita is a top FTSE 100 company”, hence there is no risk of the contractor failure. Earlier this year Carillion collapsed and went into administration. To the wider public it was a surprise and a shock. However, as more details emerge about the fall of Carillion, more questions are being asked. Why did the external auditors KPMG sign off their accounts. Why did the government hand over large scale contracts to a company that was in serious financial trouble long before it finally collapsed? “For those already thinking this sounds a bit like Carillion – you are right. A gaping pension deficit, departing CEO, shrinking cash flow and over-reliance on intangible “goodwill” in it’s accounts – signed off by KPMG. Capita’s profit warning caps a 24 month slide which saw the UK’s largest outsourcing company tumble out of the FTSE 100 index, its share price losing 80 per cent of its value since January 2016, falling from £11.60 to £2.01 today. It is not clear whether the above news of the fall of the Capita Share price has ever been noted in the Barnet Council register. Furthermore after listening to the Council debate (Tuesday 30 January 208) on contingency plans in the event of contractor failure it is blatantly clear that none of the councillors had any awareness of the Capita Share price position. Day One: Tuesday 30 January 2018. Council notes the collapse of the giant outsourcing firm Carillion earlier this month following financial problems, a number of profit warnings, the departure of its Chief Executive and a drastic plunge in its share price. Council notes the uncertainty and concern this causes for thousands of Carillion’s workers, the small businesses in its supply chain, the projects it was contracted to deliver, and the public who use the services it was contracted to provide. Council notes LB Barnet’s use of mass outsourcing contracts to provide critical back office, regulatory and other services, and therefore requests that the Policy & Resources Committee receives a report on what contingency plans are in place should anything similar happen to outsourced services in Barnet. The following motion was agreed. This is astonishing in itself as it is extremely rare for all political parties to agree on a motion. The contingency plans for insourcing will be submitted to Performance and Contract Management Committee, Tuesday 27th February, 2018 7.00 pm. This debate took place before anyone was aware that Capita were about to issue a Profit notice. The next Carillion? Shares in outsourcing firm Capita plunged 40% after profit warning. Outsourcing giant Capita announced the suspension of its dividend as part of a transformation plan this morning – and shares duly plunged by more than 40 per cent. 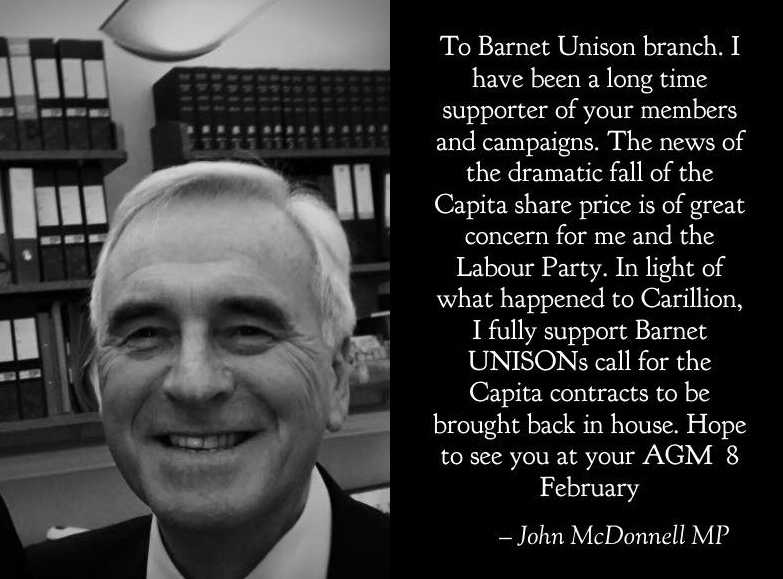 Barnet UNISON writes to Chief Executive seeking details of the contingency plans. In the debate in the House of Commons today, a Labour MP referred to Barnet Council having a contingency plan. Labour MP Rachel Reeves asked about the serious financial concerns at Capita, after £1bn was wiped off the company’s value following a suspension of dividends and £700m rights issue yesterday. The firm’s shares have now plunged by almost 50 per cent.